Wordprints provide us evidence that there is "at least 24 writers" in the Book of Mormon. These authors had a Hebrew or Semitic ancestral background. The Book of Mormon original authors left evidence of word structure, style, expressions and phrases that their cultural heritage and language background was of a "Hebrew" or "Semitic" ancestry. Fingerprints offer an infallible, and precisely correct means of identifying individuals - personal identification. Wordprints can be used to identify the person who is the author of a written letter, or legal document. Wordprints can be used to find out who the author of a book really is. What do they have to do with the Book of Mormon? Wordprinting, or "stylometry" as it is more commonly known, is the science of measuring literary style. The main assumption underlying stylometry is that an author has aspects of literary style that may be unconsciously used, and can be used to identify their work. Stylometrists analyze literature using statistics, math formulas and artificial intelligence to determine the "style" of an author's writing. Because authors may write on a variety of topics, the vocabulary they use may vary considerably. Researchers often attempt to use "non-contextual words" in their analyses to avoid this problem: patterns in the use of these words (e.g. such as: and, if, the, etc.) will be less influenced by a change in subject matter. Wordprints in the Book of Mormon indicate that there are "at least 24 authors". The initial Book of Mormon wordprint studies were carried out by Larsen, Rencher, and Layton. They compared twenty-four Book of Mormon authors (each having at least 1,000 words) to each other, and concluded on the basis of three separate statistical tests that these authors were distinct from each other and Oliver Cowdery, Joseph Smith, Jr., and Solomon Spaulding. A more sophisticated approach was taken by John Hilton and non-LDS colleagues at Berkeley. The "Berkeley Group's" method relied on non-contextual word patterns, rather than just individual words. This more conservative method was designed from the ground up, and required works of at least 5,000 words. demonstrate that wordprints were not obliterated by translation (e.g. two different authors rendered by the same translator would still have different wordprints). The Berkeley Group's methods have since passed peer review, and were used to identify previously unknown writings written by Thomas Hobbes. The Berkeley Group compared Book of Mormon texts written by Nephi and Alma with themselves, with each other, and with work by Joseph, Oliver, and Solomon Spaulding. Each comparison is assessed based upon the number of "rejections" provided by the model. The greater the number of rejections, the greater the chance that the two texts were not written by the same author. Tests with non-disputed texts showed that two texts by the same author never scored more than 6 rejections; thus, one cannot be certain if scores between 1–6 were written by the same or different authors. Scores of 0 rejections makes it statistically likely the two texts were written by the same author. Furthermore, each "rejection" is statistically independent—this means that the chance of two different authors being the product the same person can be determined by multiplying the chance of each individual failure. This is a roughly 1 in 15 trillion chance of Nephi and Alma having the same author. 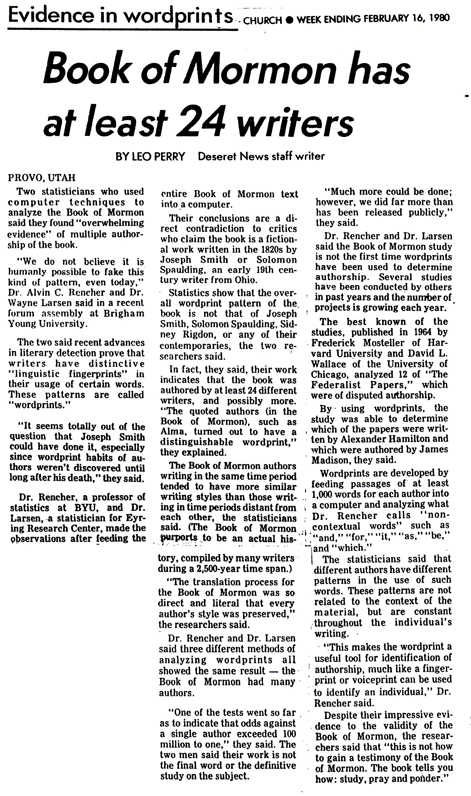 As John Hilton put the matter, if wordprinting is a valid technique, then this analysis suggests that it is statistically [defenseless] to claim that Joseph Smith, Oliver Cowdery, or Solomon Spaulding wrote the 30,000 words in the Book of Mormon attributed to Nephi and Alma. The Book of Mormon contains work written by more than one author. Those authors were not Joseph Smith, Oliver Cowdery, or Solomon Spaulding. Stylometry and The Book of Mormon (FairMormon FAIR-Cast, Faith and Reason 12, Released 7/17/14) 7:43 min.